Collectors from all around the world manage their personal collections and swap with other collectors using Colnect's personal collection management and unique Auto-Matching feature. Not long ago we announced there more than ten thousand collectors have already become members of Colnect and today we're happy to announce there are over 11111 collectors on Colnect. There has been a record growth on March and we hope to soon break that record. Technical difficulties rose as a result of the growth and we've been working very hard to optimize Colnect and upgrade our servers to better cater for our collectors. Meanwhile, our free stamp catalog has been growing rapidly and recently passed the 100,000 stamps marker. 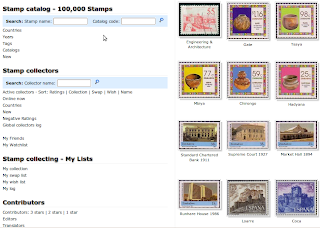 Colnect's stamp catalog reached an incredible milestone today, as 100,000 stamps have now been uploaded onto Colnect for collectors to mark in their "Collection", "Swap" and "Wish" lists. Tbis monumental achievement could not have made without the tremendous work of our volunteer stamp contributors and especially our stamps coordinators, Fabien Eicke and Klaus Jochimsen. It is because of their collaborative efforts that stamps have become the 2nd collectible category (after phonecards) to eclipse 100,000 items in our catalogs. Currently, the United States has by far the largest quantity of stamps in our catalog with over 10,000. This next closest countries are France at just under 4,000 and East Germany with slightly more than 3,000. If you would to like to help upload some of our next 100,000 stamps or any other collectible to Colnect, please feel free to contact us. This guest post was made for Colnect by Vincenzo Desroches. If you want to contribute your collecting-related article to Colnect, please contact us. While you may not be able to use your forex broker’s charts to track the philatelic market when collecting stamps, this long-favored hobby for people of all ages generally involves an element of investment. Nevertheless, much like in other fields of investing, a large percentage of stamp collectors do not buy the type of stamps that might appreciate over time. This means having a good foundation in how the stamp market operates and values stamps can make a big difference to your success in investing in stamps. Many people still think of collecting stamps as child’s play, but certain stamps command high prices and are treated like a collector’s classic automobile might be. While most stamps carry and keep their notional values, such high-value collector’s stamps can be worth over $1,000,000 at auction prices and it is this sort of stamp which typically comprises a high-end stamp collector’s investment portfolio. Stamp indices have even been added to Bloomberg which show recent annual increases of over 7%. In addition, most stamp collectors will attempt to identify any trends they see occurring in the stamp market. They will then usually consider buying stamps as an investment when they think it likely that the stamp will rise in value. This process is similar to how an investor might pick a stock. Nevertheless, stamp collectors generally must wait for a considerable period in order for their stamp investment to show a profit, if it ever does. • A stamp album or stock book – protective sleeves for individual stamps are preferred by serious collectors that do not use stamp hinges. • Stamp tongs – these are special tongs with rounded tips to prevent damage to stamps from handling them manually. • A magnifying glass – get one strong enough to see details in the stamp’s paper. While stamp hinges continue to be a popular way to affix stamps to an album, be aware that many serious investment collectors now shun the practice. This is reflected in the market for “unhinged” stamps being greater than that for stamps that were previously hinged. In fact, since the middle of the last century, the price differential in favor of unhinged stamps has grown to 2 to 1, largely due to the remnants of hinge marks that show up when the stamp is held to the light. This condition of hinged stamps involves the adhering of the original gum on the stamp to the gum on the hinge, which can strip off a layer of paper, creating what philatelists call “hinge or stamp thin.” For this reason, unhinged stamps have come to be preferred by most collectors, and so collectors should consider this when valuing and storing stamps. • Condition – stamps in mint condition sell for higher prices than damaged stamps, which often sell at only a small fraction of mint value. • Availability – assess the number of stamps of this particular kind that are currently for sale on the stamp market. • Demand – how many collectors are interested in buying this stamp in both the stamp’s country of origin and elsewhere. • Origin of the Sale – prices for stamps often differ between countries. • Future Value – an assessment of what collectors anticipate will be the stamp’s future value. In general, stamp collecting can provide people with a popular combination of a satisfying hobby, and can even be a potential investment, when a collectible stamp appreciates in value. Not only can this pursuit give a considerable degree of satisfaction by obtaining small - but potentially very valuable - works of art, but it can also provide a constructive way for a person to distract themselves from life’s other pressures. Nevertheless, future stamp investors need to be aware that stamp collecting does not enjoy the same degree of liquidity that other investment markets like the coin, forex or stock market does. Therefore, stamp collectors need to understand that their stamps may take years to show substantial gains in value, and even to cover the relatively high price spread between a stamp dealer’s buying and selling prices. Nevertheless, stamp collectors who pursue their passion with the benefits of patience and knowledge about the philatelic market can often find lucrative investment opportunities in their pastime. Naturally, you might make considerably more money faster with other investments, but collectors often enjoy just looking through their beautiful stamp collection at home.